Little fire ant (Wasmannia auropunctata) workers are monomorphic, which means they display no physical differentiation (Holway et al. 2002). The ants are typically small to medium-sized, with the workers ranging from 1-2mm (Holway et al. 2002). The little fire ant is light to golden brown in colour. The gaster is often darker. The pedicel, between the thorax and gaster, has two segments; the petiole and postpetiole. The petiole is \"hatchet-like,\" with a node that is almost rectangular in profile and higher than the postpetiole. The antenna have 11 segments, with the last two segments greatly enlarged into a distinct club. The antennal scape (the first segment) is received into a distinct groove (scrobe) that extends almost to the posterior border of the head. The thorax has long and sharp epinotal spines. The body is sparsely covered with long, erect hairs. This species is well-known for a painful sting, seemingly out of proportion to its size. Please click on AntWeb: Wasmannia auropunctata for more images and assistance with identification. The AntWeb image comparison tool lets you compare images of ants at the subfamily, genus, species or specimen level. You may also specify which types of images you would like to comare: head, profile, dorsal, or label. 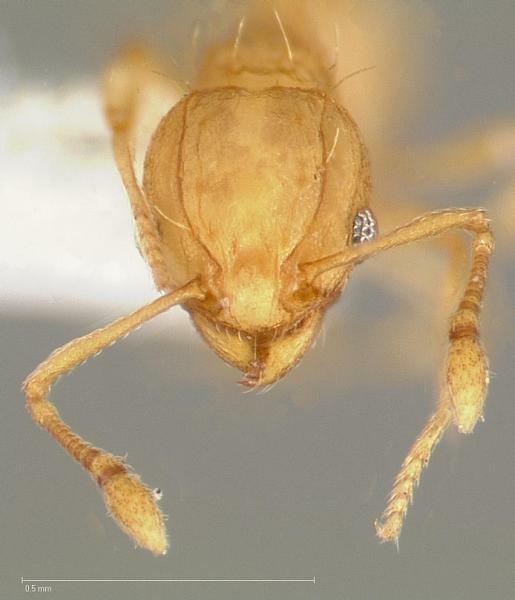 Please see the PaDIL (Pests and Diseases Image Library) species content page for Electric ant for high quality diagnostic and overview images. Cold climates appear to be unsuitable for the successful invasion and establishment of W. auropunctata in native ecosystems. However, it may survive in human habitations or infrastructures including climate-controlled buildings and greenhouses. For example, W. auropunctata is a greenhouse pest in temperate regions, such as England and Canada. Although local spread is restricted in such cases, the population may act as a “stepping stone” for the colonisation of more suitable locations (via long distance spread) (McGlynn 1999; Holway et al. 2002; J. K. Wetterer pers. comm., 2003). Invasive ants typically have a generalised feeding regime and are able to gain nutrition from a variety of sources including grains, seeds, arthropods, decaying matter and vegetation (Holway et al. 2002; Ness and Bronstein 2004). Specialised feeders, such as army ants, which prey on other social insects, are less likely than the little fire ant (Wasmannia auropunctata) to be successful in introduced regions as the range of potential prey is smaller (McGlynn 1999). Little fire ants are omnivores and are very flexible in their diet, preying on invertebrates and consuming plant parts (Romanski 2001). When honeydew-producing Homoptera are present, a large part of its diet is likely to consist of the carbohydrate-rich residues produced by these insects (J. K. Wetterer pers. comm., 2003). In human habitations, nutrition may be gained from fats (such as peanut butter) and other oily materials found in homes (Fernald 1947, in Brooks and Nickerson 2000). The little fire ant has a venomous sting that gives it a greater ability to subdue vertebrate and large invertebrate prey (Holway et al. 2002). Used as a biological control agent on plantations in Gabon and Cameroon (Bruneau de Mire 1969, in Brooks and Nickerson 2000).W. auropunctata was likely to have been transported between the large islands in the Galapagos archipelago on plants and in soil, and between the small islands on camping provisions and equipment (Roque-Albelo and Causton 1999).Growing military and commercial activity may have facilitated the increased spread of ants into the Pacific region over the last century. Commerce to and from islands must be watched more closely than exchanges between two continental areas because ants are more abundant on islands and are more likely to establish on new islands (due to higher ecological vulnerability of island ecosystems) (McGlynn 1999).Invasive ant species that are known to associate closely with humans and nest in nursery stock or other products traded locally or globally have the potential to be spread long distances by humans (Holway et al. 2002). Little fire ants are commonly associated with and distributed by humans. Nurseries, fruit tree orchards, and ornamental plants are all potential habitat for the LFA. Since these ants have an affinity for nesting at tree bases and in potted plants, they are especially easily spread between plant nurseries. 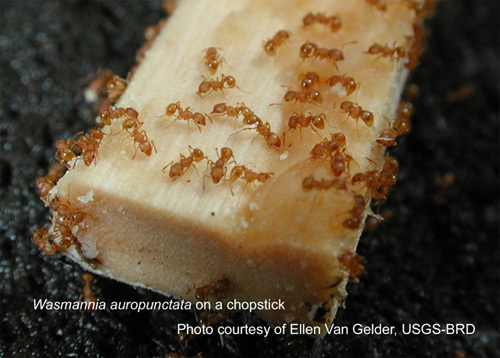 When contaminated plants are purchased and planted, the ants may become locally established (Romanski 2001).May be spread by the movement of logs and lumber products infested with the ant. It may be spread within the Solomon Islands by the movement of coconuts.May be spread by the movement of logs and lumber products infested with the ant. It may be spread within the Solomon Islands by the movement of coconuts. W. auropunctata was likely to have been transported between the large islands in the Galapagos archipelago on plants and in soil, and between the small islands on camping provisions and equipment (Roque-Albelo and Causton 1999).May be spread by the movement of logs and lumber products infested with the ant. It may be spread within the Solomon Islands by the movement of coconuts.In Cameroon the spread of the little fire ant in cocoa plantations is encouraged due to the fact that it preys on, and thereby has a role in the control of, certain herbivorous cocoa pests (Bruneau de Mire 1969, in Brooks and Nickerson 2000). Recommended citation: Global Invasive Species Database (2019) Species profile: Wasmannia auropunctata. Downloaded from http://www.iucngisd.org/gisd/species.php?sc=58 on 19-04-2019. In agricultural areas, due to the close association of the land and workers, the little fire ant may be a great nuisance to humans. This is because it is more likely to reach high densities and sting people working in the field. The increased numbers of Homoptera insects, which sap plant nutrients and make plants susceptible to disease, may cause substantial yield losses. In Cameroon, on the other hand, the spread of the little fire ant is encouraged, due to the fact that it preys on, and thereby has a role in the control of, certain herbivorous cocoa pests (Bruneau de Mire 1969, in Brooks and Nickerson 2000). W. auropunctata may have negative impacts on invertebrates and vertebrates. They may prey on native insects and cause declines in the numbers of small vertebrates. In human habitations it may sting, and even blind, domestic pets (cats and dogs) (Romanski 2001). It is believed to have caused a decrease in reptile populations in New Caledonia and in the Galapagos Archipelago, where it eats tortoise hatchlings and attacks the eyes and cloacae of the adult tortoises (Holway et al. 2002; J. K. Wetterer pers. comm., 2003). The little fire ant is probably the most aggressive species that has been introduced into the Galapagos archipelago, where a marked reduction of scorpions, spiders and native ant species in infested areas has been observed (Lubin 1984, Clark et al. 1982, in Roque-Albelo and Causton 1999). Similarly it has been noted to decrease local arthropod biodiversity in the Solomon Islands (Romanski 2001). W. auropunctata rarely buries myrmecochorous seeds and sometimes ingests elaisomes without dispersing seed. In its native range, the little fire ant decreases herbivorous arthropod biodiversity, increasing the fruit and seed production and growth of the plant and decreasing pathogen attacks. W. auropunctata may also, however, exclude arthropod plant mutualists, such as plant tenders or seed dispersers (Ness and Bronstein 2004). Please read Invasive ants impacts for a summary of the general impacts of invasive ants, such as their affect on mutualistic relations, the competitive pressure they impose on native ants and the effect they may have on vulnerable ecosystems. Please follow this link for more detailed information on the management of Wasmannia auropunctata compiled by the ISSG. Informations on Wasmannia auropunctata has been recorded for the following locations. Click on the name for additional informations. Abedrabbo, S. 1994. Control of the little fire ant, Wasmannia auropunctata, on Santa Fe Island in the Galapagos Islands. pp. 219�227 in Williams, D. F. (ed.) Exotic ants: biology, impact, and control of introduced species. Westview Press, Boulder. 332 pp. Causton, C.E., Sevilla, C and S.D. Porter. 2005. Eradication of the little fire ant, Wasmannia auropunctata from Marchena Island, Gal�pagos: On the edge of success? Florida Entomologist 88: 159-168. Delabie, J. H. C. 1989. Preliminary evaluation of an alternative technique for the control of the little fire ant Wasmannia auropunctata in cacao plantations. Agrotropica 75: 75-78. Formis: A Master Bibliography of Ant Literature. USDA, Agricultural Research Service. Summary: Webpage created to centralise information on the Wasmannia auropunctata invasion in Tahiti. Contains an assessment of the situation, images, maps, scientific documents, links and contacts. Lubin, Y. 1984. Changes in the native fauna of the Gal�pagos Islands following invasion by the little fire ant Wasmannia auropunctata. Biol. J. Linn. Soc. 21: 229- 242. Roque, Albelo L., Causton, C. E. and Mieles, A. 2000. The ants of Marchena Island, twelve years after the introduction of the little fire ant, Wasmnnia auropunctata. Noticias de Gal�pagos. Silberglied, R. 1972. The �little fire ant,� Wasmannia auropunctata, a serious pest in the Galapagos Islands. Noticias Galapagos 19/20: 13�15. Souza, E., Follett, P.A., Price, D.K., Stacy, E.A. (2006). Field Suppression of the Invasive Ant Wasmannia auropunctata (Hymenoptera: Formicidae) in a Tropical Fruit Orchard in Hawaii. Journal of Economic Entomology 101(4): 1068-1074. SPREP. 2003. Report on the 2nd Pilot of SPREP Invasive Species Training Course in Vanuatu. Ulloa Chac�n, P. and Cherix, D. 1994. Perspectives on control of the little fire ant, (Wasmannia auropunctata), on the Galapagos Islands. In Williams, D. F. (ed.) Exotic ants: Biology, impact, and control of introduced species. Westview Press, Boulder, CO: 63-72. Walker, K. 2006. Electric ant (Wasmannia auropunctata) Pest and Diseases Image Library. Updated on 9/09/2006 11:06:31 AM. Waterhouse, D. F. 1997. The Major Invertebrate Pests and Weeds of Agriculture and Plantation Forestry in the Southern and Western Pacific. The Australian Centre for International Agriculture Research, Canberra. Summary: Compiled tables of the distribution and importance of invertebrate pests. Alonso, L. E. 1969. Spatial and temporal variation in the ant occupants of a facultative ant-plant. Biotropica 30: 201-213. Armbrecht, I. and Ulloa-Chac�n, P. 2003. The Little Fire ant Wasmannia auropunctata (Roger) (Hymenoptera: Formicidae) as a Diversity Indicator of Ants in Tropical Dry Forest Fragments of Colombia, Environ. Entomol. 32(3): 542-547. Summary: A report on the significant correlation between the abundance of W. auropunctata and low native ant biodiversity in fragmented Colombian forests. Brooks, S. and Nickerson, J.C. 2000. Featured Creatures. Bruneau, de Mir� P. 1969. Une formi utilis�e au Cameroun dans la lutte contre les mirides du cacaoyer: Wasmannia auropunctata Roger. Caf� Cacao Th� 13: 209-212. Summary: Abstract: The author drew attention to the fact that in order to keep their plantations healthy the Boulous of Kribi area in Cameroun made use of an ant that had most probably been imported: Wasmannia auropunctata Roger. These ants were carried from one plantation to another in basket traps made of bundles of raphia leaflets and containing sugar cane or palm nut parings as bait which had been left in contact with the ants for at least three days. A trial showed that in less than ten days after being deposited these traps contained both larvae and immature adults of Wasmannia auropunctata. Knock-down counts from cacao trees in the Kribi region showed that this ant has driven away the mirids and Crematogaster ants and has reduced the number of insects generally, especially the Hemiptera, Orthoptera and Coleoptera. On the other hand, it contributed to the presence of psyllids and coccids of the genus Saisseria. Clark, D. B, Guayasamin, C., Pazmino, O., Donoso, C. and Paez de Villacis, Y. 1982. The tramp ant Wasmannia auropunctata: Autoecology and effects on ant diversity and distribution on Santa Cruz Island, Galapagos. Biotropica 14(3): 196-207. Conant, P. and Hirayama, C. 2000. 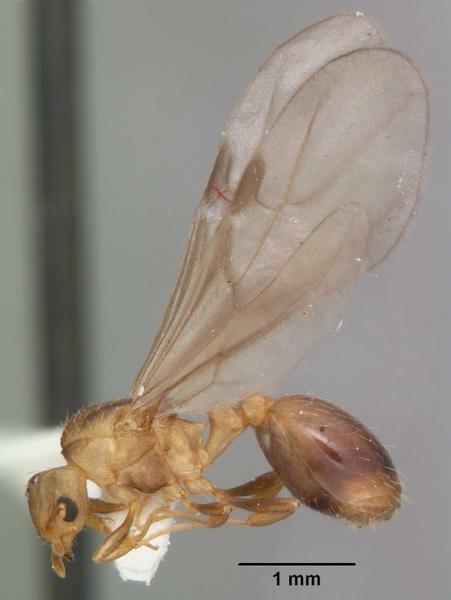 Wasmannia auropunctata (Hymenoptera: Formicidae): established on the Island of Hawaii. Bishop Museum Occasional Papers 64: 21-22. Delabie, J. H. C., da Encarnacao, M. A. V. and Cazorla, I. M. 1994. Relations between the little fire ant, Wasmannia auropunctata, and its associated mealybug, Planococcus citri, in Brazilian cocoa farms. In: D. F. Williams (Ed.) Exotic Ants: Biology, Impact, and Control of Introduced Species. Westview Press, Boulder, CO: 91-103. Delabie, J.H.C., Jahyny, B., Cardosodo do Nascimento, I., Mariano, C.S.F., Lacau, S., Campiolo, S., Philpott, S.M. & Leponce, M. (2007). Contribution of cocoa plantations to the conservation of native ants (Insecta: Hymenoptera: Formicidae) with a special emphasis on the Atlantic Forest fauna of southern Bahia, Brazil. Biodiversity Conservation 16: 2359-2384.
de la Vega, I. 1994. Food searching behavior and competition between Wasmannia auropunctata and native ants on Santa Cruz and Isabela, Gal�pagos Islands. In Williams, D. F. (ed.) Exotic Ants: Biology, Impact, and Control of Introduced Species. Westview Press, Boulder, CO: 73-79.
de Souza, A. L. B., Delabie, J. H. C. and Fowler, H. G. 1998. Wasmannia spp. (Hym., Formicidae) and insect damages to cocoa in Brazilian farms. Journal of Applied Entomology 122: 339-341. Summary: Diagnostic insect damage to cocoa tree leaves and fruits were compared in situations with and without the presence of the little fire ants, Wasmannia auropunctata and the closely related and sympatric W. cf rochai. No significant differences in thrips, lepidopteran, or chrysomelid beetle damage to fruits, or to young and old leaves, were associated with these ants. However, significant increases of pseudococcids Planococcus citrii, associated with areas dominated by W. auropunctata, and to a lesser degree with W. cf rochai, were present. W. auropunctata has been reported to be a canopy mosaic dominant in cocoa farms, but the lack of reduced herbivore incidences and its lack of spatial permanence do not support favoring its populations for the management of phytophagous insect control. Deyrup, M., Davis, L. and Cover, S. 2000. Exotic ants in Florida. Transactions of the American Entomological Society 126: 293-326. Summary: More than 50 species of exotic ants have established breeding populations in Florida. This is the largest exotic ant fauna of any U.S. state. An annotated list of species (including distribution, origin, and pest status) includes 4 new records for the U.S.
Fabres, G. and Brown, W. L. Jr. 1978. 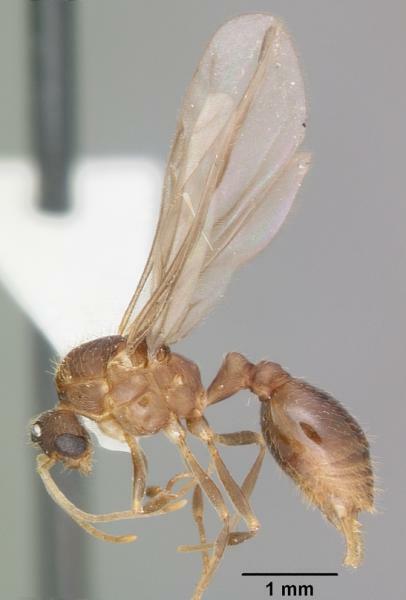 The recent introduction of the pest ant Wasmannia auropunctata into New Caledonia. Journal of the Australian Entomological Society 17: 139-142. Fernald, H. T. 1947. The little fire ant as a house pest. J. Econ. Entomol. 40: 428. Guilbert, E., Chazeau, J. and De Larbogne, L. B. 1994. Canopy arthropod diversity of New Caledonian forests sampled by fogging: Preliminary results. Memoirs of the Queensland Museum. Brisbane 36, No. 1: 77-85. Summary: Faunal composition and community structure of canopy arthropods was analyzed from insecticidal fogging samples in 3 types of New Caledonian forests: dense evergreen forest on ultramafic alluvium (Riviere Bleue), sclerophyllous forest on limestone and cong. Jackson, P. F. R. 1976. Fire-ants pose threat to Galapagos conservation. Environmental Conservation 3: 268. Jourdan, H. 1997. 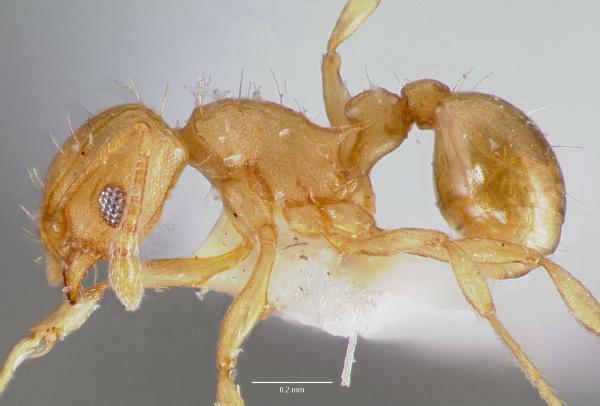 Threats on Pacific Island: the spread of the Tramp Ant Wasmannia auropunctata. Pacific Conservation Biology 3(1): 61-64. Jourdan, H., Sadlier, R. and Bauer, A. 2000. Premieres observations sur les consequences de l invasion de Wasmannia auropunctata 1863 (Roger) sur les predateurs superieurs dans les ecosystemes neo-caledoniens. Actes Coll. Insectes Sociaux 13: 121-126. Kamura, C.M., Morini, M.S.C.,, Figueiredo, C.J., Bueno, O.C. &Campos-Farinha, A.E.C. (2007). Ant communities (Hymenoptera: Formicidae) in an urban ecosystem near the Atlantic Rainforest. Brazilian Journal of Biology 67(4): 635-641. Keller, L., Cherix, D. and Ulloa-Chacon, P. 1989. Description of a new artificial diet for rearing ant colonies as Iridomyrmex humilis, Monomorium pharaonis and Wasmannia auropunctata (Hymenoptera: Formicidae). Insectes Sociaux 36: 348-352. McGlynn, T. P. 1999. Non-native ants are smaller than related native ants. American Naturalist 154: 690-699. Summary: I compare the sizes of non-native and native ants to evaluate how worker size may be related to the ability of a species to invade new habitats. I compare the size of 78 non-native ant species belonging to 26 genera with the size of native congeneric species. Meier, R. E. 1985. Interference behavior of two tramp ants (Hymenoptera: Formicidae) at protein baits on the Galapagos Islands, Ecuador. Experientia 41: 1228. Meier, R. E. 1994. Coexisting patterns and foraging behavior of introduced and native ants (Hymenoptera Formicidae) in the Galapagos Islands. In Williams, D. F. (ed.) Exotic Ants: Biology, Impact, and Control of Introduced Species. Westview Press, Boulder, CO: 44-62. Rapp, G. 1999. Introduction of the fire ant Wasmannia auropunctata into Vanuatu. Ag. Alert 18: 1. Romanski, A. 2001. Introduced Species Summary Project: Little Fire Ant (Wasmannia auropunctata). Roque-Albelo, L. and Causton, C. 1999. El Ni�o and Introduced Insects in the Gal�pagos Islands: Different Dispersal Strategies, Similar Effects, Noticias de Gal�pagos (60). Solomon, S.E. & Mikheyev, A.S. (2005). The ant (Hymenoptera: Formicidae) fauna of Cocos Island, Costa Rica.Florida Entomologist 88(4): 415-423. Spencer, H. 1941. The small fire ant Wasmannia in citrus groves - a preliminary report. Florida Entomologist 24: 6-14. Tennant, L. E. 1994. The Ecology of Wasmannia auropunctata in primary tropical rainforest in Costa Rica and Panama. In Williams, D. F. (ed.) Exotic ants: Biology, impact, and control of introduced species Westview Press Boulder, CO: 80-90. Walker, K.L. (2006). Impact of the Little Fire Ant, Wasmannia auropunctata, on Native Forest Ants in Gabon. Biotropica 38(5): 666�673. Williams, D. F. and Whelan, P. M. 1992. Bait attraction of the introduced pest ant, Wasmannia auropunctata (Hymenoptera: Formicidae) in Galapagos Islands. J. Entomol. Sci. 27(1): 29-34. 5353 Parkside Drive, Jupiter FL 33458, USA.